This is an R package for performing genetic stock identification (GSI) and associated tasks. Additionally, it includes a method designed to diagnose and correct a bias recently documented in genetic stock identification. The bias occurs when mixture proportion estimates are desired for groups of populations (reporting units) and the number of populations within each reporting unit are uneven. In order to run C++ implementations of MCMC, rubias requires the package Rcpp, which in turn requires an Rtools installation (if you are on Windows) or XCode (if you are on a Mac). After cloning into the repository with the above dependencies installed, build & reload the package to view further documentation. The script “/R-main/coalescent_sim” was used to generate coalescent simulations for bias correction validation. This is unnecessary for testing the applicability of our methods to any particular dataset, which should be done using assess_reference_loo() and assess_pb_bias_correction(). coalescent_sim() creates simulated populations using the ms coalescent simulation program, available from the Hudson lab at UChicago, and the GSImulator and ms2geno packages, available at https://github.com/eriqande, and so requires more dependencies than the rest of the package. if one gene copy is missing from a locus in an indivividual, then both gene copies must be missing at the locus. the name of the locus is taken to be the column name of the first column of each pair of locus columns. The header on the second column is ignored. sample_type: a column telling whether the sample is a reference sample or a mixture sample. repunit: the reporting unit that an individual/collection belongs to. This is required if sample_type is reference. And if sample_type is mixture then repunit must be NA. This must be a character vector. Not a factor. The idea of a “reporting unit” is well-known amongst people doing genetic stock identfication of salmon, but might not be familiar elsewhere. Briefly, a reporting unit is a group of populations (which we call “collections”) that are typically closely related genetically, and which will likely be aggregrated in the results of the GSI exercise. collection: for reference samples, the name of the population that the individual is from. For mixture samples, this is the name of the particular sample (i.e. stratum or port that is to be treated together in space and time). This must be a character, not a factor. indiv a character vector with the ID of the fish. These must be unique. The file can have any number of other meta data columns; however, they must all occur in the data frame before the columns of genetic data. When you pass a data frame into any of these functions, you have to tell it which column the genetic data starts in, and it is assumed that all the columns after that one contain genetic data. If you are doing a mixture analysis, the data frame of mixture fish and of the reference fish must have the same column structure, i.e., they must have exactly the same number of columns with exactly the same column names, in the same order and of the same type. At the request of the good folks at ADFG, I introduced a few hacks to allow the input to include markers that are haploid (for example mtDNA haplotypes). To denote a marker as haploid you still give it two columns of data in your data frame, but the second column of the haploid marker must be entirely NAs. When rubias is processing the data and it sees this, it assumes that the marker is haploid and it treats it appropriately. Note that if you have a diploid marker it typically does not make sense to mark one of the gene copies as missing and the other as non-missing. Accordingly, if you have a diploid marker that records just one of the gene copies as missing in any individual, it is going to throw an error. Likewise, if your haploid marker does not have every single individual with and NA at the second gene copy, then it’s also going to throw an error. # have pretty much the same genotype at these loci! Check that out. This reveals 33 pairs in the data set that are likely duplicate samples. If we reduce the min_frac_matching, we get more matches, but these are very unlikely to be the same individual, unless genotyping error rates are very high. A more principled approach would be to use the allele frequencies in each collection and take a likelihood based approach, but this is adequate for finding obvious duplicates. How about known-origin individuals in the mixture? In some cases, you might know (more or less unambiguously) the origin of some fish in a particular mixture sample. For example, if 10% of the individuals in a mixture carried coded wire tags, then you would want to include them in the sample, but make sure that their collections of origin were hard-coded to be what the CWTs said. Another scenario in which this might occur is when the genetic data were used for parentage-based tagging of the individuals in the mixture sample. In that case, some individuals might be placed with very high confidence to parents. Then, they should be included in the mixture as having come from a known collection. The folks at the DFO in Nanaimo, Canada are doing an amazing job with PBT and wondered if rubias could be modified to deal with the latter situation. We’ve made some small additions to accommodate this. rubias does not do any actual inference of parentage, but if you know the origin of some fish in the mixture, that can be included in the rubias analysis. The way you do this with the function infer_mixture() is to include a column called known_collection in both the reference data frame and the mixture data frame. In the reference data frame, known_collection should just be a copy of the collection column. However, in the mixture data frame each entry in known_collection should be the collection that the individual is known to be from (i.e. using parentage inference or a CWT), or, if the individual is not known to be from any collection, it should be NA. Note that the names of the collections in known_collection must match those found in the collection column in the reference data set. These modifications are not allowed for the parametric bootstrap (PB) method in infer_mixture(). mixing_proportions: the mixing proportions. The column pi holds the estimated mixing proportion for each collection. indiv_posteriors: this holds, for each individual, the posterior means of group membership in each collection. Column PofZ holds those values. Column log_likelihood holds the log of the probability of the individuals genotype given it is from the collection. Also included are n_non_miss_loci and n_miss_loci which are the number of observed loci and the number of missing loci at the individual. A list column missing_loci contains vectors with the indices (and the names) of the loci that are missing in that individual. It also includes a column z_score which can be used to diagnose fish that don’t belong to any samples in the reference data base (see below). mix_prop_traces: MCMC traces of the mixing proportions for each collection. You will use these if you want to make density estimates of the posterior distribution of the mixing proportions or if you want to compute credible intervals. bootstrapped_proportions: This is NULL in the above example, but if we had chosen method = "PB" then this would be a tibble of bootstrap-corrected reporting unit mixing proportions. In some cases there might be a reason to explicitly set the parameters of the Dirichlet prior on the mixing proportions of the collections. 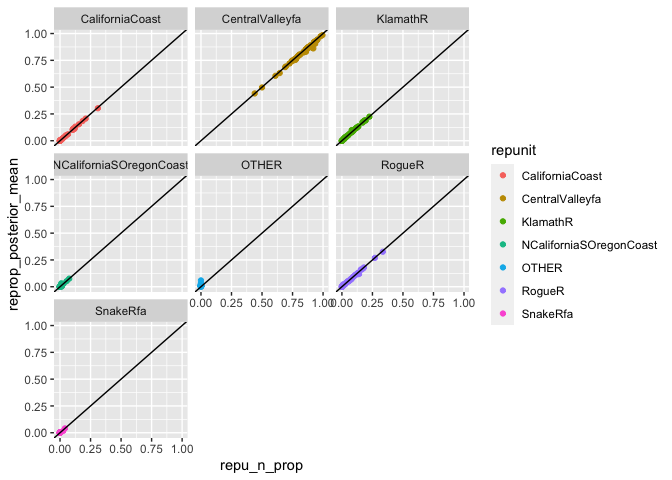 For a contrived example, we could imagine that we wanted a Dirichlet prior with all parameters equal to 1/(# of collections), except for the parameters for all the Central Valley Fall Run populations, to which we would like to assign Dirichlet parameters of 2. That can be accomplished with the pi_prior argument to the infer_mixture() function, which will let you pass in a tibble in which one column named “collection” gives the collection, and the other column, named “pi_param” gives the desired parameter. 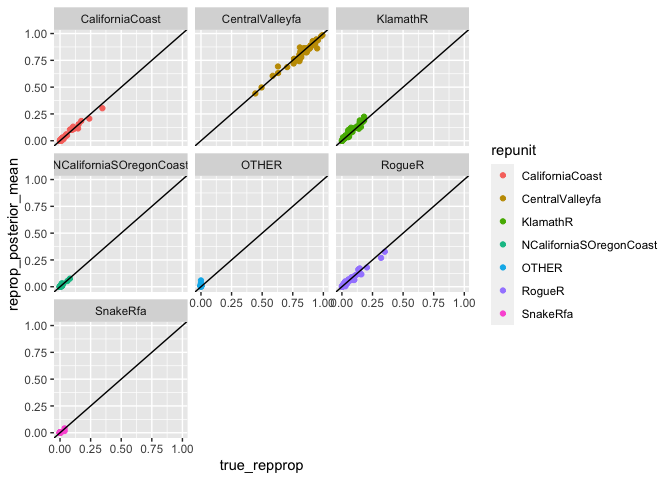 #> Joining, by = "collection"
We see that for the most part this change to the prior changed the distribution of fish into different collections within the Central Valley Fall reporting unit. This is not suprising—it is very hard to tell apart fish from those different collections. However, it did not greatly change the estimated proportion of the whole reporting unit. This also turns out to make sense if you consider the effect that the extra weight in the prior will have. The full MCMC output for the mixing proportions is available by default in the field $mix_prop_traces. This can be used to obtain an estimate of the posterior density of the mixing proportions. Sometimes totally unexpected things happen. One situation we saw in the California Chinook fishery was samples coming to us that were actually coho salmon. Before we included coho salmon in the reference sample, these coho always assigned quite strongly to Alaska populations of Chinook, even though they don’t really look like Chinook at all. In this case, it is useful to look at the raw log-likelihood values computed for the individual, rather than the scaled posterior probabilities. 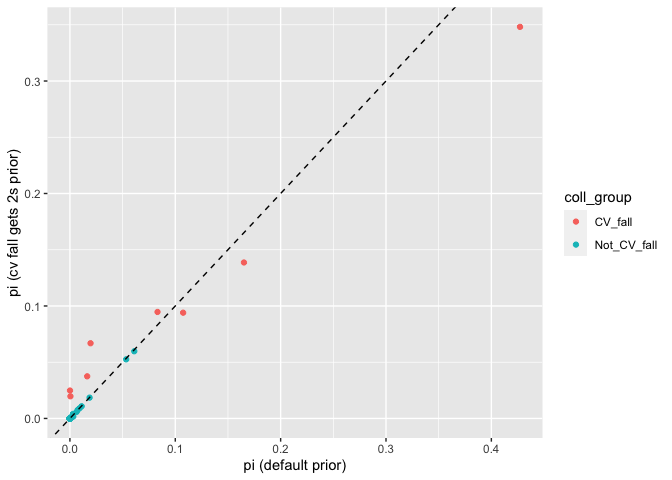 Because aberrantly low values of the genotype log-likelihood can indicate that there is something wrong. However, the raw likelihood that you get will depend on the number of missing loci, etc. rubias deals with this by computing a z-score for each fish. The Z-score is the Z statistic obtained from the fish’s log-likelihood (by subtracting from it the expected log-likelihood and dividing by the expected standard deviation). rubias’s implementation of the z-score accounts for the pattern of missing data, but it does this without all the simulation that gsi_sim does. This makes it much, much, faster—fast enough that we can compute it be default for every fish and every population. If everything is kosher, then we expect that the z-scores we see will be roughly normally distributed. 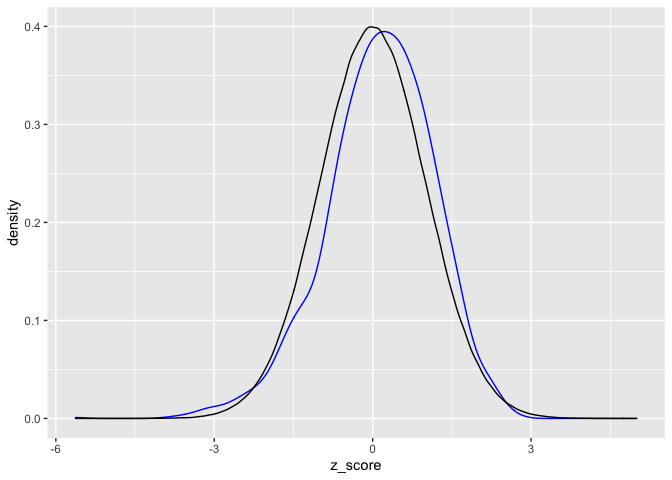 We can compare the distribution of z-scores we see with a bunch of simulated normal random variables. The z_score statistic is most useful as a check for individuals. It is intended to be a quick way to identify aberrant individuals. If you see a z-score to the maximum-a-posteriori population for an individual in your mixture sample that is considerably less than z_scores you saw in the reference, then you might infer that the individual doesn’t actually fit any of the populations in the reference well. Here I include a small, contrived example. We use the small_chinook data set so that it goes fast. Now, we will do the same analysis, but pretend that we know that the first 8 of the 36 fish in fishery rec1 are from the Deer_Cr_sp collection. First we have to add the known_collection column to the reference. kc_mix$known_collection[kc_mix$collection == "rec1"][1:8] <- "Deer_Cr_sp"
The output from infer_mixture() in this case can be used just like it was before without known individuals in the baseline. A standard analysis in molecular ecology is to assign individuals in the reference back to the collections in the reference using a leave-one-out procedure. This is taken care of by the self_assign() function. The log_likelihood is the log probability of the fish’s genotype given it is from the inferred_collection computed using leave-one-out. The scaled_likelihood is the posterior prob of assigning the fish to the inferred_collection given an equal prior on every collection in the reference. Other columns are as in the output for infer_mixture(). Note that the z_score computed here can be used to assess the distribution of the z_score statistic for fish from known, reference populations. This can be used to compare to values obtained in mixed fisheries. assess_reference_loo(): This function carries out simulation of mixtures using the leave-one-out approach of Anderson, Waples, and Kalinowski (2008). assess_reference_mc(): This functions breaks the reference data set into different subsets, one of which is used as the reference data set and the other the mixture. It is difficult to simulate very large mixture samples using this method, because it is constrained by the number of fish in the reference data set. Additionally, there are constraints on the mixing proportions that can be simulated because of variation in the number of fish from each collection in the reference. Both of the functions take two required arguments: 1) a data frame of reference genetic data, and 2) the number of the column in which the genetic data start. repunit_scenario and integer that gives that repunit simulation parameters (see below about simulating multiple scenarios). collections_scenario and integer that gives that collection simulation paramters (see below about simulating multiple scenarios). n the actual number of fish from the collection in the simulated mixture. post_mean_pi the posterior mean of mixing proportion. mle_pi the maximum likelihood of pi obtained using an EM-algorithm. By default, each iteration, the proportions of fish from each reporting unit are simulated from a Dirichlet distribution with parameter (1.5,…,1.5). And, within each reporting unit the mixing proportions from different collections are drawn from a Dirichlet distribution with parameter (1.5,…,1.5). The value of 1.5 for the Dirichlet parameter for reporting units can be changed using the alpha_repunit. 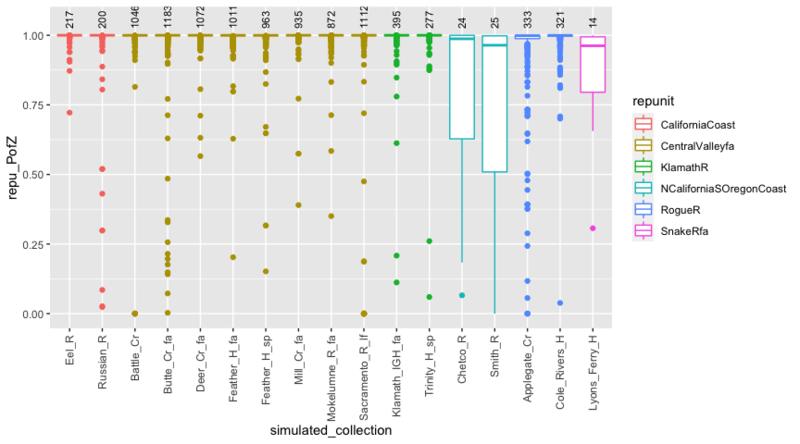 The Dirichlet parameter for collections can be set using the alpha_collection parameter. the proportion of individuals from each repunit (or collection). These ppn values will be normalized to sum to one if they do not. As such, they can be regarded as weights. the parameters of a Dirichlet distribution from which the proportion of individuals should be simulated. and then put them in a cnts column. 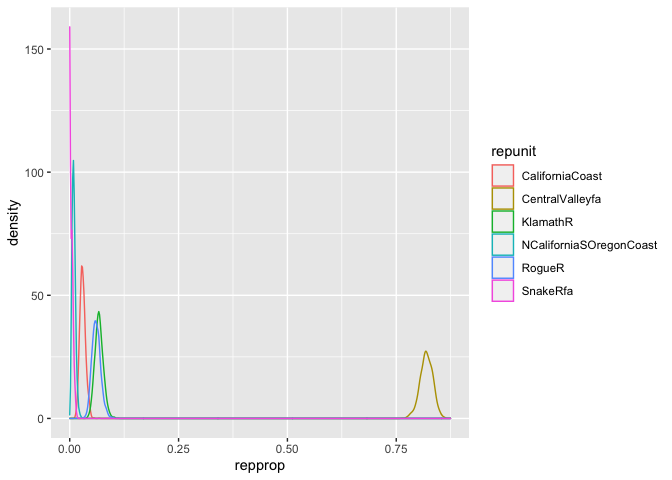 Let’s do some simulations with those repunit parameters. By default, if we don’t specify anything extra for the collections, they get dirichlet parameters of 1.5. # now, call those repunits that we did not specify in arep "OTHER"
Or plot comparing to their “n” value, which is the actual number of fish from each reporting unit in the sample. Quite often you might be curious about how much you can expect to be able to trust the posterior for individual fish from a mixture like this. You can retrieve all the posteriors computed for the fish simulated in assess_reference_loo() using the return_indiv_posteriors option. When you do this, the function returns a list with components mixture_proportions (which holds a tibble like chin_sims_repu_top6 in the previous section) and indiv_posteriors, which holds all the posteriors (PofZs) for the simulated individuals. In this tibble: - indiv is an integer specifier of the simulated individual - simulated_repunit is the reporting unit the individual was simulated from - simulated_collection is the collection the simulated genotype came from - PofZ is the mean over the MCMC of the posterior probability that the individual originated from the collection. # the same repunit are grouped together in the plot. By default, individuals are simulated in assess_reference_loo() by resampling full multilocus genotypes. This tends to be more realistic, because it includes as missing in the simulations all the missing data for individuals in the reference. However, as all the genes in individuals that have been incorrectly placed in a reference stay together, that individual might have a low value of PofZ to the population it was simulated from. Due to the latter issue, it might also yield a more pessimistic assessment’ of the power for GSI. An alternative is to resample over gene copies—the CV-GC method of Anderson, Waples, and Kalinowski (2008). And in that, we find somewhat fewer fish that have low posteriors, but there are still some. This reminds us that with this dataset, (rather) occasionally it is possible to get individuals carrying genotypes that make it difficult to correctly assign them to reporting unit. If you are simulating the reporting unit proportions or numbers, and want to have more control over which collections those fish are simulated from, within the reporting units, then the sub_ppn and sub_dirichlet settings are for you. These are given as column names in the alpha_collection data frame. 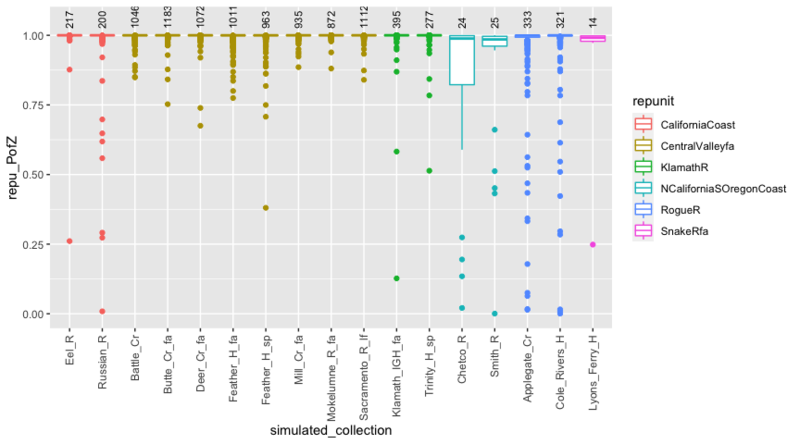 We will let the collections within them just be drawn from a dirichlet distribution with parameter 10 (so, pretty close to equal proportions). #>  "Hanford_Reach" "Applegate_Cr"  "N_Santiam_H"   "Soos_H"
It gives us a result that we expect: no appreciable difference, because the reporting units are already very well resolved, so we don’t expect that the parametric bootstrap procedure would find any benefit in correcting them. Anderson, Eric C, Robin S Waples, and Steven T Kalinowski. 2008. “An Improved Method for Predicting the Accuracy of Genetic Stock Identification.” Can J Fish Aquat Sci 65: 1475–86. Added support for haploid markers (#14, @krshedd). Added support for individuals of known origin (i.e. those identified with great accuracy using parentage-based tagging) in the mixtures (#12). Allow user to specify the total weight on the symmetrical Dirichlet prior for the mixing proportions in infer_mixture(). Enforced the requirement that fish of sample_type == "mixture" must have NA for their repunit. When things aren't NA, infer_mixture() would throw an error when method == "PB" because there were extra factor levels floating around. In the process I allow for the repunit column to be either character or logical as setting it to NA will always make it a logical if it is not part of a data frame with other non-missing character values in it. Added support for user-specified initial starting values for the pi parameter (the mixing proportions of collections) in the function infer_mixture(). This is the first version submitted to CRAN.